NBA Finals, Game 3: Aptly named? So far, the NBA Finals has been a tale of two blowouts. The most recent one belongs to the San Antonio Spurs, who routed the Miami Heat 113-77 to take a 2-1 series lead. 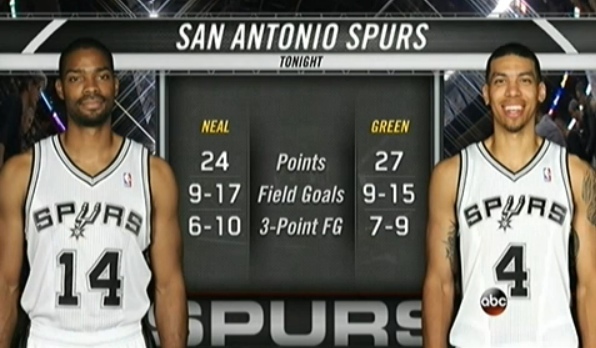 The big story on offense was the three-point shooting of Danny Green and Gary Neal, who together made 13/19 shots from distance. As a team, the Spurs shot 50% from behind the arc, and they attempted 32 such shots. Thirty-two three-point attempts seemed like a lot to me. The season average across all teams this year was 19.9, that number representing a record high. Thirty-two attempts is not an all-time record, though. In 1996, Dallas attempted forty-nine three-pointers in a 127-117 win over New Jersey. (Somebody named George McCloud was responsible for twenty of those attempts. The Nets, as a team– a team featuring none other than future Maverick Shawn Bradley– only attempted five. Rick Mahorn also played in that game, so do with that what you will.) 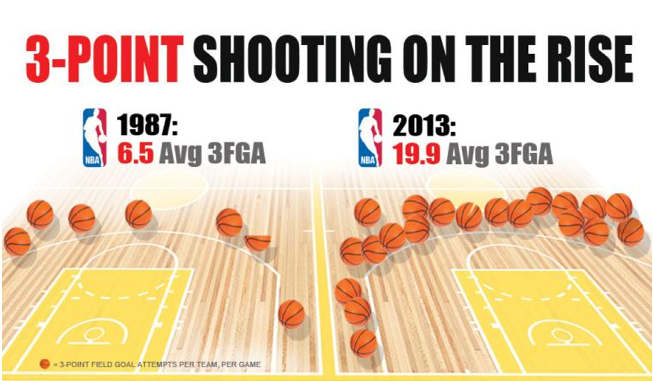 In fact, there have been 404 games in NBA/ABA/BAA history in which a team attempted at least 33 three-point shots. It isn’t even the most this season, in which eighty-three games saw a team attempt at least 33 threes, and seven of those performances came in these playoffs. All time, only twenty-three playoff games have seen at least thirty-three attempts, though, which certainly comports with the trend the Sporting News discussed in the above-linked story on the steep increase in three-point shooting. That the Spurs’ thirty-two attempts on Tuesday seemed like a lot to me only means that I haven’t been watching a lot of NBA basketball in recent years, which is absolutely correct. Enjoy game 4 tonight if you’re capable of enjoying such things. This entry was posted in ALDLAND and tagged basketball-reference, danny green, gary neal, heat, miami, nba, san antonio, sporting news, spurs by AD. Bookmark the permalink.